Lunch meeting at the Rotary Club of Queenstown was a fellowship luncheon. As usual there was good food and good company. 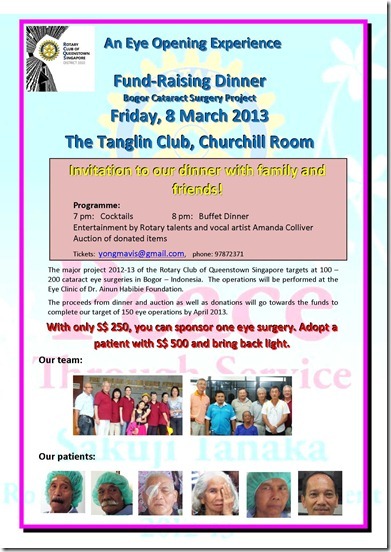 PE Hans Jaeger gave an update on the upcoming major project fund raising for Rotary Cub of Queenstown 2013. In conjunction with the March 8th Bogor Cataract Fund Raising Dinner and Dance, there will also be an auction for this fund raising project. It is hoped all fellow rotarians will support this good cause.